Prayers, thoughts, and reflections on the Sacred Heart of Jesus often focus on reparation for the ingratitude our Lord has so often experienced in the Eucharist. He is indeed a Prisoner of Love, frequently left alone in the Tabernacle or received with indifference or, worse, sacrilege, in Holy Communion. This prayer below, however, covers another key component in our relationship with our Lord: Adoration. As such it’s good for a Holy Hour or any other time spent with Jesus in the Blessed Sacrament! Jesus expressed to St. Margaret Mary Alacoque, a 17th Century French nun, his desire for a Holy Hour as part of a devotion to His Sacred Heart. This prayer brings to mind the three elements most associated with illustrations of Jesus' Sacred Heart, such as the one above: the Cross from His Passion, the fire of His Love, and the thorns symbolizing Humanity's ingratitude! Heart of Jesus, the shadow of the Cross was upon You from the first moment of Your earthly life. You foresaw the bitter sufferings which would befall You, and You embraced them eagerly for love of me. I adore Your infinite love. Teach me to find my salvation with You and my glory in Your Cross. Heart of Jesus, the sins of an ungrateful people have crowned You with thorns. In sorrow and contrition I cast myself before You. Most meek and patient Heart of Jesus, forgive my sins and teach me to bear all sufferings patiently according to Your example. Heart of Jesus, You wished to be pierced on the Cross that all men might find their way to You through Your open Side. I adore You as the living temple of the Divinity. Within You are all the treasures of wisdom, of grace, and of mercy. In all my thoughts, words, and actions let me live in You. Heart of Jesus, I adore your boundless love which caused You to shed Your Blood for me. My soul longs to recieve Your Precious Blood that I may persevere to the end with an ever increasing zeal in Your service. Heart of Jesus from which water also flowed, I adore You as the fountainhead of eternal life. Through this water, which is a symbol of our rebirth in the Sacrament of Baptism, cleanse my heart of earthly affections that, dying to this world, I may live for You alone. Heart of Jesus, furnace of divine charity and the perfect altar of sacrifice of the New Testament , I adore and praise You. You came to cast fire upon the earth, and You want it to be enkindled. Inflame my cold heart with that fire that I may be consumed with love for you. Amen. 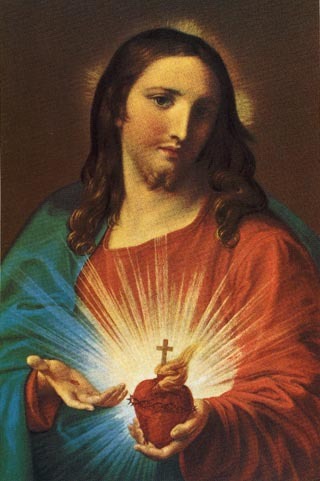 Most holy Heart of Jesus, fountain of every blessing, I adore You, l love You, and with a lively sorrow for my sins, I offer You this poor heart of mine. Make me humble, patient, pure, and perfectly obedient to Your Will. Good Jesus, grant that I may live in You and for You. Protect me in the midst of danger; comfort me in my afflictions. Give me health of body, assistance in my temporal needs, Your blessing on all that I do, and the grace of a holy death. One of the great things about this prayer is its scriptural and Eucharistic resonances. For example, in the first paragraph when we read that Jesus foresaw His bitter sufferings, it brings to mind our Lord's stern rebuke to Peter over the necessity of His Passion, Death and Resurrection (Matt 16:21-13). The Passion theme, begun with the Cross, continues in the second paragraph with a reference to his being crowned with thorns by our sins (Matthew 27:29, Mark 15:17, and John 19:2, 5). In this case, it isn't just the first century Roman soldiers that have caused His suffering, but us as well. The reference to our Lord's being pierced in His Side in the third paragraph ties is especially fitting. After all, it was from Jesus' Sacred Heart that blood and water flowed (John 19:34) which symbolizes the Sacraments of the Eucharist and Baptism in the next two paragraphs. In the sixth paragraph we read that our Lord's Sacred Heart is the "perfect altar of sacrifice of the New Testament". This resonates with an important message from the letter to the Hebrews, namely that, since Jesus made the ultimate sacrifice by laying down His life as the Lamb of God at Calvary, His Precious Blood was the ultimate sin offering, making obsolete the all previous sacrifices of the blood of bulls and goats (Hebrews Ch. 10). And finally, we have that wonderful reference to the fire symbolizing Jesus' burning love for Humanity when he said "I have come to cast a fire upon the earth. And what should I desire, except that it may be kindled?" (Luke 12:49). May this prayer help warm whatever coldness you feel in your own heart from the day-to-day struggles of life. The supplication in the final paragraph for Jesus' aid in such times is meant for all of us! As St. Margaret Mary, whom our Lord once called His Heart's "beloved disciple", once said: "The bitterest sorrow is but sweetness in this adorable Heart, where everything is changed to love."